Before & After School: The first bell rings at 9:25 and the tardy bell at 9:30. There is morning playground supervision starting at 9:05. Often I have meetings or may be in and out of the classroom until the start of school day. I welcome students into the classroom at 9:25. They can walk themselves directly to class (we won’t be lining up outside). Please let me know how your child gets home after school and when there is a change in your routine. School ends at 3:40 and I dismiss them from our classroom. Daily reading homework Our school-wide focus on reading includes a nightly reading-at-home. Please be a partner in our “Book Baggie” routine in which your child will be given books that he/she will read at both school and at home. 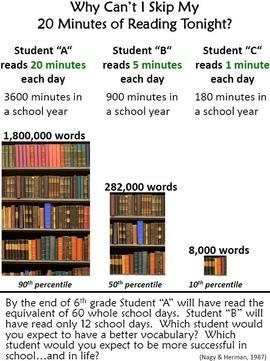 It is important to maintain involvement with this; we ask that your child reads for at least 100 minutes a week (about 20 min/night). Homework: The main homework is nightly reading. In addition we encourage students to use ST Math, Raz-Kids, update Weeblys and use other apps and programs available through our library resources page. Occasionally there will be at-home work to complete while we are doing special projects and word work. In the case that a child has school work to get caught up on, that may also be sent home to complete. Take-home Folder: Every day your child will bring home an orange “boomerang” folder and must return it to school EACH DAY. Important notes and work may be sent home through your child’s folder. Papers on the “return to school” side will need to be filled out and sent back to school. Please take the time to go through your child’s folder and empty out what’s on the “keep at home” side. Feel free to send notes to me and/or the school on the “return to school” side of the folder. Snack and Water Bottles: Your child will need to bring a daily snack to school. I find that fresh and healthy snacks keep us best energized. I suggest foods such as fruit, cheese, yogurt, etc. Please do not bring in juice, sweets, or chips. I will keep snacks at school for kids who forget. Water bottles: Children are encouraged to bring water bottles to school. Please make sure that they close tightly to avoid spills. Water bottles will be sent home at the end of each week to be washed and your child is responsible to bring them back to school. Birthday Schedule: We love birthdays and Mr. Elliott does a nice job recognizing birthdays for the week at our all-school Monday Morning Meetings. In class we will do a special song and ceremony where families are welcome to join. If you would like to bring something to share with the class, you can do so with a book to read that is either loaned or donated to the classroom. As a school-wide policy, we will not be doing birthday treats. We will celebrate summer birthdays as “half-birthdays.” Invitations- Please do not deliver party invitations at school.